Since the switch from Skype 7 to Skype 8, we sometimes forget that some features have been lost along the way and that Microsoft is working on their return. 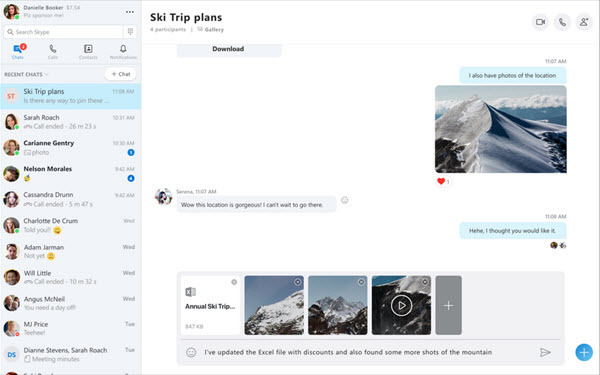 As a result, the Redmond firm has fallen behind its competitors on features that have become basic but are not included in Skype. One of them should finally arrive very soon. The preview of the images is coming! It is through a short announcement on its site that Microsoft announced the upcoming arrival of file and image preview in Skype 8.42.76.37. When you want to send an image to a contact, you will have access to a reduced view with the thumbnails of the images. The user will even be able to send text along with a photo, something that is currently impossible. On its short presentation, Microsoft also indicates that this new feature will initially be exclusive to Skype's computer versions, i.e. Windows, Mac and Linux. Another update will be dedicated to the Android and iOS versions later. Users who are testing the preview version of Skype on their computer can already take advantage of this new feature. The others will have to wait for the next update, which should come very soon. You're single, young, and you're 50 or what? Find a person to share your passions with this dating application. The mobile dating application for single young people aged 50 and over.